Writer Paul Allen has adapted Mark Herman’s screenplay to bring the much-loved British film to the stage,in this appealing, amusing and affecting production. Allen introduces the device of a narrator, the eight-year-old Shane (played by a young-looking Luke Adamson) through whose eyes we see the lives of a fictional Yorkshire mining community in the 1990s. Shane’s child’s-eye view simplifies the situation, focussing on the effects of a proposed and then inevitable pit closure on the domestic lives of the miners and their families. As Shane’s mum Sandra, Rebecca Clay carries a lot of the emotional heat of the play, as she struggles to put food on the table. The play only touches on the desperation, hardship and starvation of the people who were in this predicament. The mining communities may have gone but child poverty is still very much with us under our present Tory (in all but name) government. The script’s jibes at the Tories go down well but such is the overall nostalgic feel of the production, they may as well be joking about Hitler or Julius Caesar. The miners play in a brass band, led by Danny (John McArdle off of Brookside) who stands for tradition and principle. Music is everything, he says, right up until a death bed conversion to the maxim that people are everything, and nothing matters if people don’t. McArdle is suitably gruff and hard-faced throughout. Danny’s death coincides with the mine’s closure and therefore the disbanding of the band. It’s the end of an era and men of principle like Danny (and the late Tony Benn) are all but extinct. Andrew Dunn provides comedy and pathos as Phil, whose broken trombone is the least of his problems; James Robinson is the handsome Romeo whose budding relationship with Gloria (Clara Darcy) is threatened when it emerges she has been working for the evil management, boo hiss. There is earthiness and coarse humour to the script- the cast as a whole hit the right note. The music itself is a real treat. The stirring rendition of Rodrigo’s Concierto d’Aranjuez is a showstopper, and there is a poignant version of Danny Boy that tugs the heartstrings. The tour provides opportunities for local brass bands to perform alongside the actors. Director Damian Cruden keeps the action fluid on Dawn Allsop’s multiple-location set, which keeps the pit head at the centre of it all. The setting (particularly with a grown man playing an eight-year old) reminds me of Blood Brothers, and there are echoes of The Pitman Painters in the story. 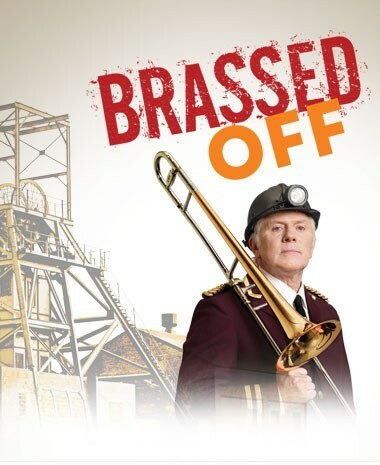 Unlike the latter, Brassed Off looks very much to the past. I would prefer a bit more agit-prop with my pit-prop. The characters may lose their fight but at least they stand up and fight. It’s a cosy piece of entertainment with emotional if not political resonance. The humour, the likeable cast and the wonderful music are what make this show worth seeing.